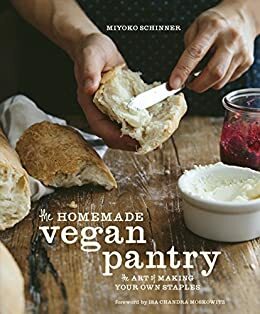 The Homemade Vegan Pantry: The Art of Making Your Own Staples - Kindle edition by Miyoko Schinner. Cookbooks, Food & Wine Kindle eBooks @ Amazon.com. A guide to creating vegan versions of pantry staples--from dairy and meat substitutes such as vegan yogurt, mayo, bacon, and cheese, to dressings, sauces, cookies, and more. Studded with full-color photos, The Homemade Vegan Pantry celebrates beautiful, handcrafted foods that don't take a ton of time, from ice cream and pizza dough, to granola and breakfast sausage. Miyoko Schinner guides readers through the techniques for making French-style buttercreams, roasted tomatoes, and pasta without special equipment. Her easy methods make "slow food" fast, and full of flavor. Vegan Yack Attack on the Go! : Plant-Based Recipes for Your Fast-Paced Vegan Lifestyle •Quick & Easy •Portable •Make-Ahead •And More! "Store-bought vegan foods are aften processed to compensate for nonvegan ingredients, but as chef Miyoko Schinner argues, it's easy to make tasty staples at home, from eggless mayo to pancake mix." 5.0 out of 5 starsThe Essential Guide to Making Delicious Vegan Staples - Wouldn't Be Without It! This is the book you need to get started creating vegan staples. If I could choose only one book out of all of the books I purchased last year, this would be the book I would keep. 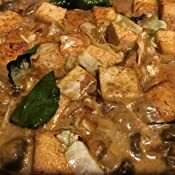 Miyoko's recipes are simple, require mostly standard ingredients, and create some of the most fantastic vegan food I have eaten to date. 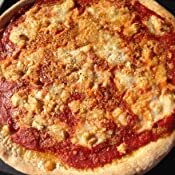 There is a reason that Miyoko's recipes for vegan cheese come out so good - she actually sells her vegan cheese online. With this book you can make your own ketchup, butter, unribs, unsteak, unchicken, vegan fish sauce, and teriyaki sauce! You can make vegan mozzarella that bakes, browns, and crisps up on a pizza. You can make vegan ice cream and vegan yogurt. You can make a roll of vegan chocolate chip cookie batter you can cut off pieces of and use as needed. I am sharing pictures of a pizza I made with the vegan mozzarella cheese from this book, a pork chop I made using the Unpork recipe, and tofu red curry I made where the essential ingredient was Miyoko's vegan fish sauce. There are specialty ingredients that certain recipes require and I would make sure to purchase the recommended ingredients and not attempt to substitute other ingredients that may seem similar. For instance, the liquid soy lecithin is essential to the Glorious Butterless Butter recipe. When tapioca is mentioned for the cheese recipes, you will need to use tapioca flour. For the fermented tofu liquid for the vegan fish sauce, purchase a bottle of fermented tofu from an Asian grocery store that appears clear - if the fermented tofu is darker or reddish, that means it has chilies in it, and you will not want to use that kind of fermented tofu for this recipe. 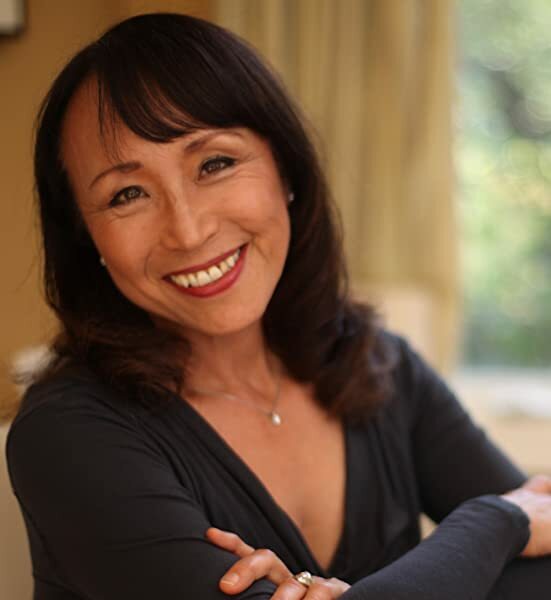 I contacted Miyoko through her website and she was very helpful in clarifying what specific items were required and where to purchase them. She is incredibly kind and responsive. When you are culturing your vegan cheese, I found it worked better when I waited the full two days for the cheese's ingredients to culture. If you want to start with a recipe that is a surefire hit, I would highly suggest the Unsteak recipe. If you don't drink alcohol, for recipes that have mirin and wine incorporated, you can find mirin and non-alcoholic wines that have the majority of the alcohol removed. I used Honteri Mirin from the local Asian grocery store and Fre Alcohol Removed Merlot. While the book suggests to use mirin that only incorporates rice and koji (and this is the perfect choice if you do not have an alcohol free household), I found that the flavors were still there with the Honteri Mirin while the alcohol was not. While you are using this book, you will notice that a number of recipes incorporate multiple variations. 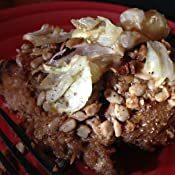 The cashew cream recipe page alone has additional recipes for bechamel, alfredo, and mushroom sauce. The Glorious Butterless Butter recipe has four variations you can try after trying the main recipe. I love how comprehensive this book is. 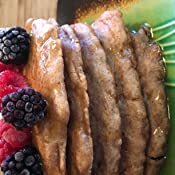 After the recipe for flax seed egg whites, Miyoko includes recipes for flax seed omelets, frittata, and quiche. You can make ice cream or gelato or sorbet, homemade jam, mustard, and mayonnaise, bread, crackers and cakes - the list of different recipes this book incorporates can really stock your entire vegan pantry. There is even a recipe for cinnamon rolls. I made the ketchup recipe in about 5 minutes with ingredients I already had in my fridge and pantry. It was worlds better than the corn syrup based ketchup you can typically find at the store. If you are a fan of seafood but are vegan and haven't found good recipes that incorporate the flavors you have been missing, Miyoko has a whole section of this book dedicated to vegan seafood. You can make vegan fish, crab cakes, chowder - even vegan fish sauce! The vegan fish sauce has to be my favorite addition to Thai dishes. It brings back all of the subtleties of flavor I missed in the dishes I used to love before I was vegan. It's so good that I will probably use it the next time I order Thai food takeout - there is nothing like having the essential flavors and nuances of Thai food on my palate again. This book is absolutely the most comprehensive and detailed recipe guide I have found to vegan cooking. Miyoko knows vegan cooking and everything I have made using this book has been absolutely delectable. It would be the first book I would recommend to a friend who was newly vegan. This is not a "quick fix" book BUT - if you like slow food, homemade food or cooking from scratch (especially if it's easy) this is your book. Most of the recipes are straightforward and made with ingredients a vegan who likes to cook will have on hand. So far, I've tried the almond milk and soy milk - both delicious, both easy but the resulting milks were quite different. I've tried the yogurt (I made mine with the chia seed variation) and it was really good - and easy! I don't normally like yogurt but I took some for lunch with berries and it was really good. I've also made the rejuvelac (and can't wait to use it to crank out some cheese) and the almond feta. The almond feta recipe alone is worth the cost of the book. It's SO GOOD! I haven't had dairy cheese in years and these cheese recipes are an excellent alternative. I also made the "Well crafted Mac and Cheese" - was really doubtful on this but it actually thickened up and tasted out-of-this-world good! I'll be keeping a jar of this mix on hand all the time for "junk food days" I don't have to feel guilty about later. I'm looking forward to making the butter, the cheeses and the condensed soups to freeze ahead of time. This is an amazing book - I've threatened to cook all the recipes in a book before but this time - I think I'm going to do it. 5.0 out of 5 starsShe couldn't make it easier! I've become a vegan book hoarder and all of them are beautifully designed and interesting. But quite a few I rarely use because they have either light print - hard to read unless in the best of light - or dust covers that keep falling off and recipes/ingredients too complicated for every day cooking. The first thing I noticed about Miyoko's book was the print. With my eyesight that's important. Even the smallest print can be read in the worst light (which is often the time I'm cooking) and the lovely rustic photo is on the hard cover - no dust cover falling off or getting in the way. The recipes are uncomplicated and easy to follow from basic ketchup, creme fraiche,yuba bacon, unsausage,custard, baking mix, and much more. I didn't realize how easy it is to make your own staples, it's going to save me a ton of money and searching round the shops. Try finding yuba where I live (you won't.) It takes minutes to make and all you need is 4 cups of soy milk! Already I'm stocked with pancake mix, butter, crackers, pizza dough, ranch dressing and fresh (handmade) pasta. None were difficult to make. Tonight I'm going to try the italian meatballs - very interesting recipe. So far, I've not had to buy one ingredient - I've found them all in my usual vegan pantry stock. I couldn't be more delighted. Can I give this 100 stars?? I can't even tell you how much I absolutely love this book! I have already made a lot of the recipes and they are easy and everything I have made is delicious! The recipes just turn out so well. I only wish I had gotten this sooner! I have had to get a few special ingredients I hadn't used before but it has been well worth it! I put pictures of the easy-cheat-method jam, whole wheat pancakes, almond creamer, and the vegan Alfredo sauce.